Handmade in Austria, KoMo's Fidibus 21 grain mill is compact but powerful. 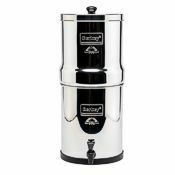 Its attractive beechwood veneer cabinet houses a set of advanced corundum-ceramic burrs and a strong, high efficiency motor with the torque and stamina needed for grinding grain. 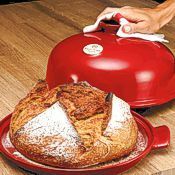 Its solid beechwood hopper holds nearly two pounds of grain, yet the mill's compact footprint requires little space in your kitchen. The Fidibus 21 grinds 5 to 6 oz. of flour per minute for bread flour texture. 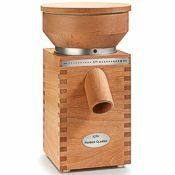 It's the ideal grain mill for exploring the joys of cooking with healthful, natural foods. 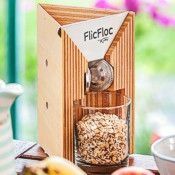 The Fidibus 21 will grind soft or hard wheat, oat groats (dehulled oats), rice, triticale, kamut, spelt, buckwheat, barley, rye, millet, teff, quinoa, amaranth, and sorghum. It will also grind lentils, most dry beans (pinto, red, kidney & more), and dried, non-oily spices. 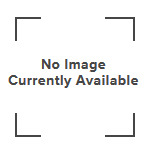 It isn't suitable for garbanzo beans (chickpeas), herbs, oilseeds like flax or sesame, popcorn, or fibrous materials. 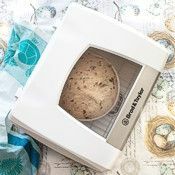 The KoMo Fidibus 21 grinds oats to a wonderfully soft, fine textured flour, but open the stones about five clicks wider than you would for a hard grain like wheat, otherwise the soft oat flour will fill the stones' furrows and infeed will stop. Opening the stones farther will give you a cereal grind for porridge, or coarser yet for cracked oats, similar to steel-cut. Grind texture is continuously adjustable from fine flour to coarse meal and cracked grain, simply by turning the hopper bowl to align its index mark with the graphic scale on the front of the mill. Cleanup is minimal and easy, and access to the milling chamber takes only a moment, requiring no tools. Award winning performance: KoMo's Fidibus 21 mill received the highest rating from the German natural products magazine Oeko Test, and it's one of our most popular KoMo grinders. 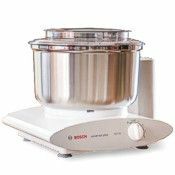 Choose from 110V or 230V models: The KoMo Fidibus 21 electric grain mill is available in the standard 110V version for use on U.S. power, or a 230V version for use overseas. Mills with 230V power are equipped with a Euro plug. More details about the KoMo Fidibus 21 mill are available under the specs tab, above. 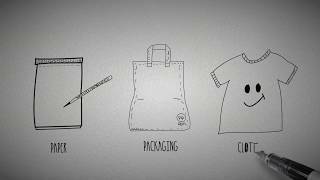 Optional interchangeable inserts: If you prepare food for someone with a food allergy, see KoMo's optional interchangeable insert system. 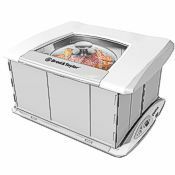 This innovative solution lets you grind different types of grain in the same mill while keeping food types completely separate. Beautiful and strong, wood is one of the most renewable raw materials on our planet, and is far longer-lasting than any kind of plastic. 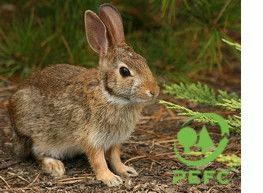 Did you know that choosing a KoMo mill helps preserve not only beech forests, but also the habitat for woodland creatures like this wild hare? I've been using this grain grinder for over 10 years--and this is after years of using other grain grinders. I love that it can just sit on my counter top and when I need flour, I shove a bowl under the spout and within minutes have the flour I need without having to put together and take apart what sounds like a jet engine spewing flour in my kitchen. It couldn't be easier than this. I have bought one for each of my daughters and recommend it to anyone that wants to have their own whole grain freshly ground flour. The Komo mill works very well with wheat and it does not look like anything can go wrong with it. It did not so well with chickpeas. They would not feed through until I backed the adjustment toward coarse almost all the way and then I jot a mixture of flour and half cracked beans. They would also shoot out at high speed. I have not tried with other beans yet. I ended up using my BlendTec for the chickpea flour. However, prior to buying the Komo I had no idea that you could even make flour out of beans. I read it in the manual so decided to try it and I am grateful for that inclusion in the manual. 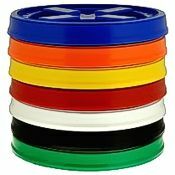 I would still buy this again. 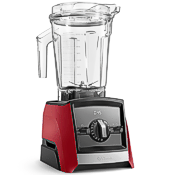 Also one difference between the Fidibus and Classic that is not described on the website is that if you are going to make cornmeal you need to grind twice with the Fidibus and according to the manual the Classic can grind in one pass. If I had known this I would have purchased the Classic instead. I have not tried cornmeal yet though. The only difference I could tell from the website was that the Classic ground faster than the Fidibus. Simplicity is the overall feature. A simple design with an attractive wood case. User friendly due to the simple adjustments for grind size. Noise level was just a low hum before grain was added, then when grinding it was like a vacuum cleaner running. Cleanup was just pulling out some flour remaining in the spout. Access to the mill stones for cleaning was also simple. It required the grain feed bowl be turned counterclockwise so it could be lifted off exposing the mill stones. A vacuum cleaner would lift out any residual flour, but a brush would also work. So far I've ground some wheat to clean the new stones and two lbs of rye for bread. It took about five minutes to grind the rye on a fine setting. I'm used to using a manual mill for 35 years, so the downside is I will lose my upper body muscle tone. This machine does the job, no problem. Now where is the nearest gym? I was surprised by how fast it grinds even at the finest setting. 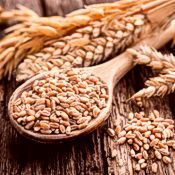 We grow our own wheat and our wheat berries have been waiting for the KoMo Fidibus 21 grain mill as it suits our needs perfectly. It gives a perfect grind with no mess, no cleaning. It's always ready to be used again. 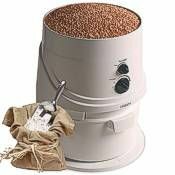 This is an outstanding grain mill, it makes a very good and fine flour, even better than pastry flour. You can set it to a coarse setting too. The flour production rate is quite adequate for this size of mill. And the support at Pleasant Hill Grain is outstanding. You can buy from them with confidence. We got the top stone detached from the plastic part that holds it and they sent us the replacement assembly free of charge and they included additional bottom grinding stone too! They stand behind their products! First off, shipping was insanely fast. I ordered on Thursday and it arrived on Friday! I immediately placed the grinder on my counter and love how beautiful it is and such a nice addition to the kitchen. It's so wonderful, works perfectly, and gets used every day. Adjusting from coarse to fine is straightforward and simple--no guessing games. 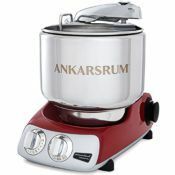 Holds a lot of grain at a time for grinding and makes flour in a very reasonable amount of time. I recommend it to everyone I know! I really like this grain mill. I love making my own flour, and this does such a nice job. 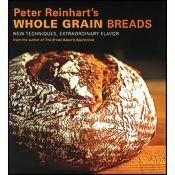 I've done wheat berries, einkorn berries all kinds of gluten free flours, and this machine handles them all with ease. Very, very happy with my purchase and would recommend highly. 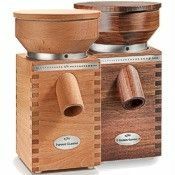 I have celiac disease so wanted to buy a mill to grind grains with. Almost as a spur of the moment thing I researched the best mills, saw this one, and bought it. I've never regretted it. It's beautiful, simple, and very effective. It isn't even super noisy, though of course there is some noise. I love it. One of the best investments ever made! I bought this mill based on reviews, description, and appearance. It is surely one of the best investments I have ever made! 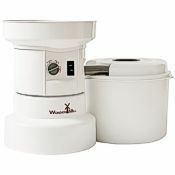 I use it to grind wheat berries for making my own flour, and I love the way it works! 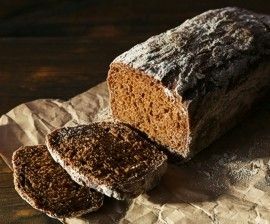 Fast, efficient, convenient, and does a beautiful job of rendering beautiful, fine-textured flour. SO worth the cost! Turning the hopper while in operation allows the easiest way to achieve the correct grind of flour. I can grind very fine for a whole wheat pastry flour, all the way to a cracked wheat. I have found that by grinding a small amount of white rice and discarding it before each actual use maintains clean grinding stones. By using the coarse setting first crack garbanzo beans or small white beans then grind them for flour. 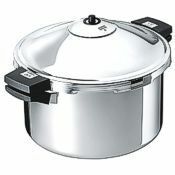 This I can use for instant hummus or to thicken soups and stews. If you've never experienced truly fresh bread you're really in for a treat! 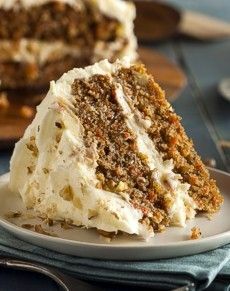 From the time you start grinding to the finished baked product the aroma in your home is truly appetizing. The Fidibus 21 is easy to use and clean, and looks beautiful too—we leave it out on the counter. I recommend it highly.